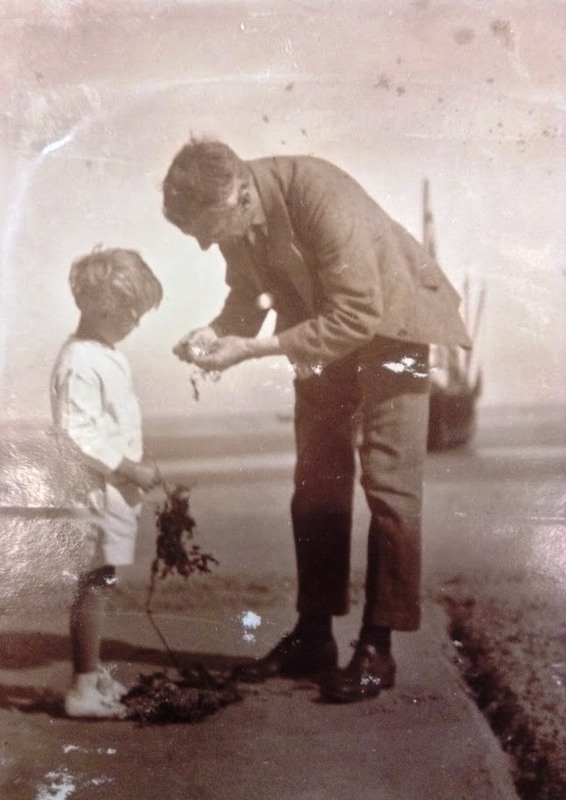 With father’s day coming up this weekend, I thought it would be interesting to blog about the father/son relationship between Godfrey and Hector Thomson. When Hector was born in 1917, it was clear that Godfrey had a new test-subject in his infant son! 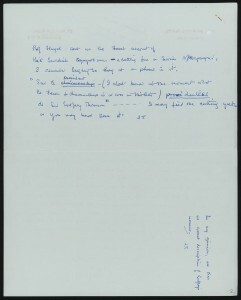 Immediately after Hector was born, Thomson began to keep a journal recording his son’s development from his birth until the age of ten (ref: Coll-1310/1/7), a copy of which is among the records of the Godfrey Thomson collection. 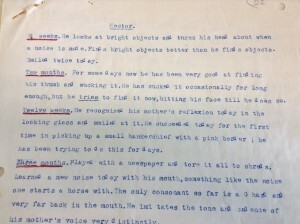 This journal is fascinating in its level of observation and detail about young Hector, and shows the depth of Godfrey’s commitment to understanding childrens development and intelligence. 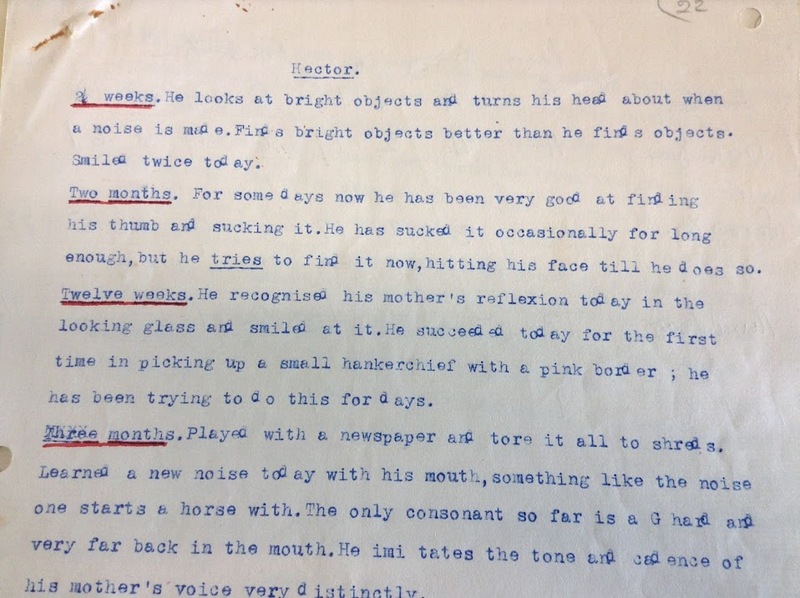 Who knows what Hector thought about the in-depth analysis of his behaviour and speech throughout his childhood, but the entries give a great insight into what it must have been like in the Thomson household. 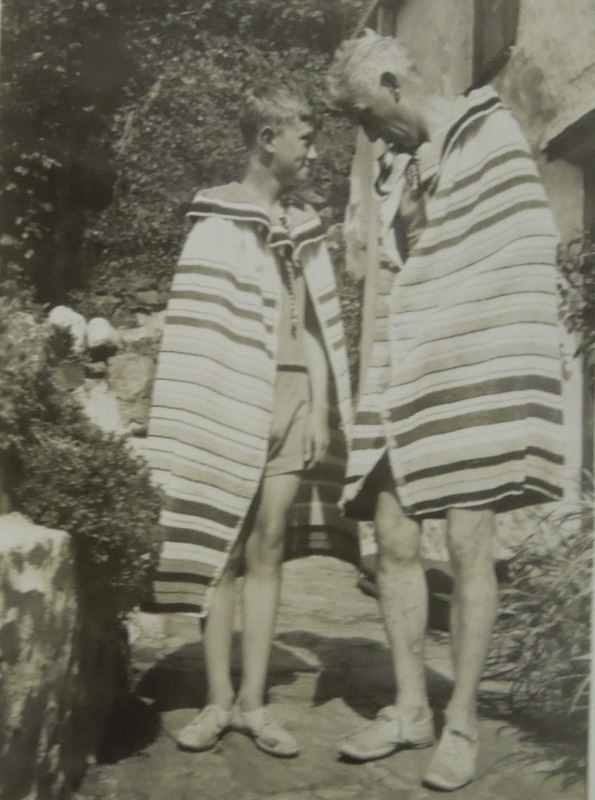 The many photographs in the Thomson family albums illuminate the family further, and contain several charming pictures of Hector and Godfrey together. 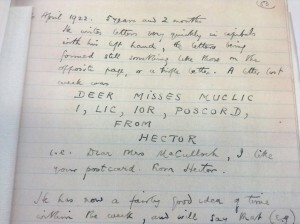 Frequent diary entries contain details about Hector’s early years, including his thumb-sucking, his ability to see his mother in the mirror, picking up items, first words, illnesses and learning to walk. 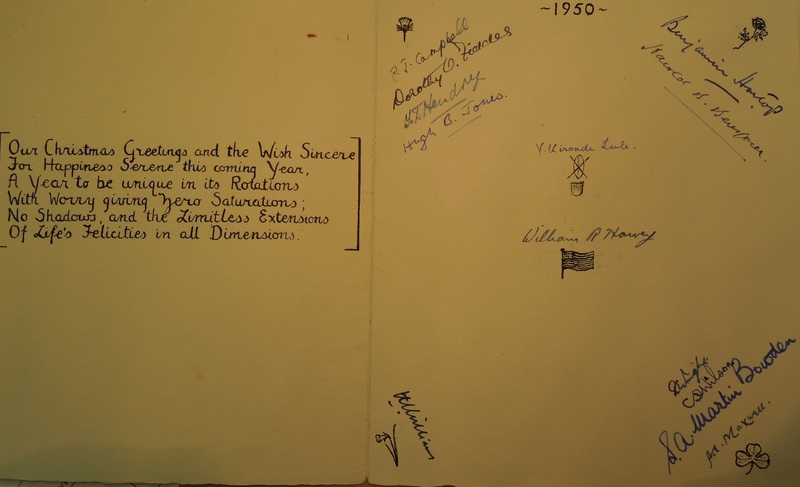 As the years went by, quotes from the rather amusing Hector were also recorded in the journal, as well as stories he made up, dreams he recounted for his parents and several drawings. Despite early attempts by his parents to make him write with his right hand, his natural tendency to left handedness won out in the end! 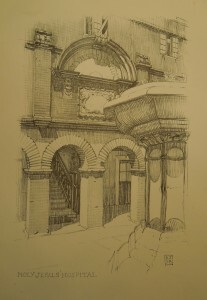 Interestingly he had a propensity to write in mirror image, which is shown in some of his drawings. 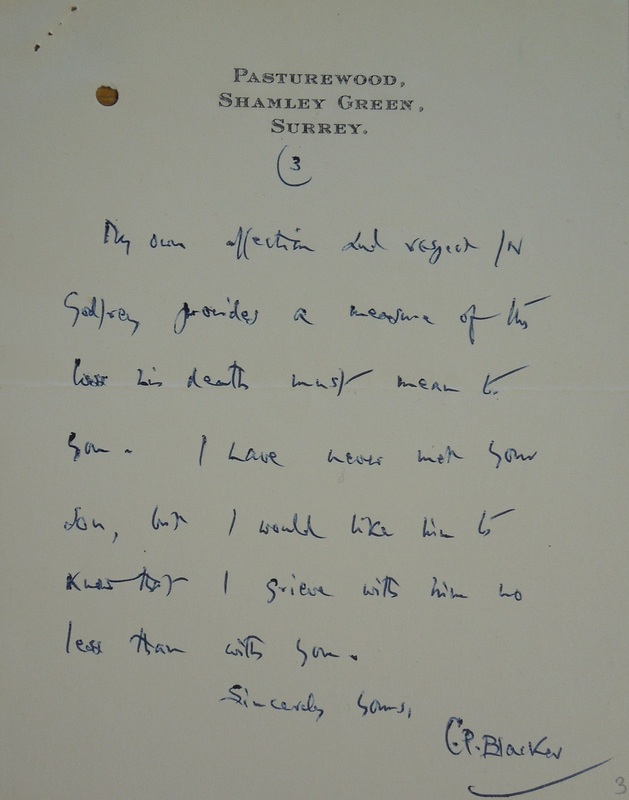 Godfrey was obviously very interested in Hector’s intellectual development and the scientific conclusions he could draw from his observations; but this file is also a testament of the affection, pride and amusement he felt while watching his son growing up. Earlier blog entries have told about Hector as an adult, his wide ranging travels and his marriage to Andromache. 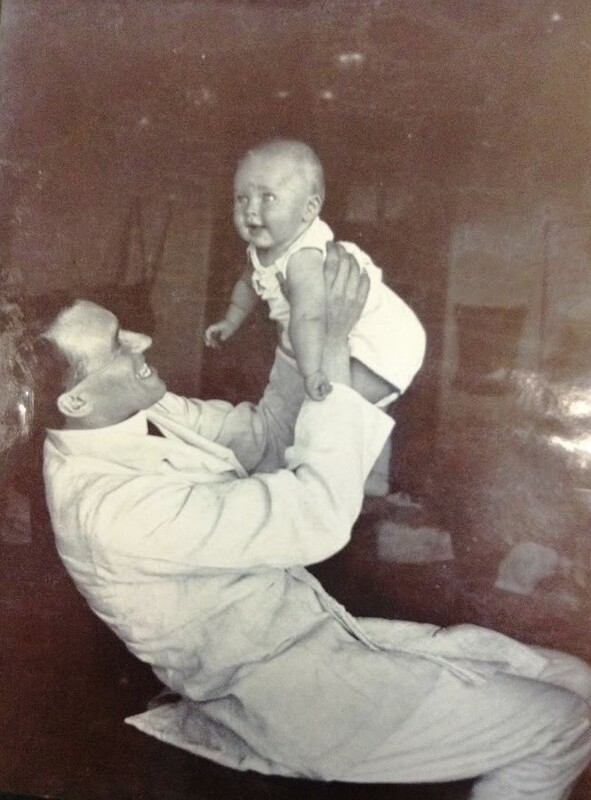 Rather touchingly, even as an adult he always referred to Godfrey as “Daddy”. 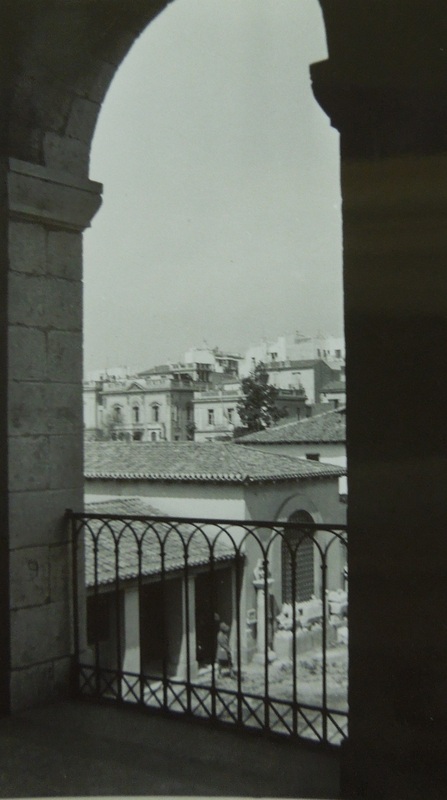 He followed in his father’s footsteps into the field of education to become a popular and well respected teacher in Nicosia and later at the University of Aberdeen. 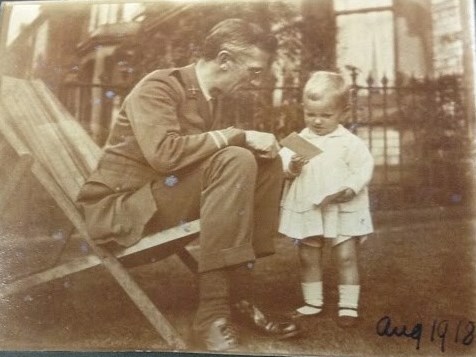 This entry was posted in Uncategorized and tagged Centre for Research Collections, Childhood Photographs, CRC, Edinburgh university Library Special Collecions, Fathers Day, Godfrey Thomson, Hector Thomson, Intelligence, personal papers, Professor Sir Godfrey Thomson on June 10, 2014 by godfreythomsonproject. 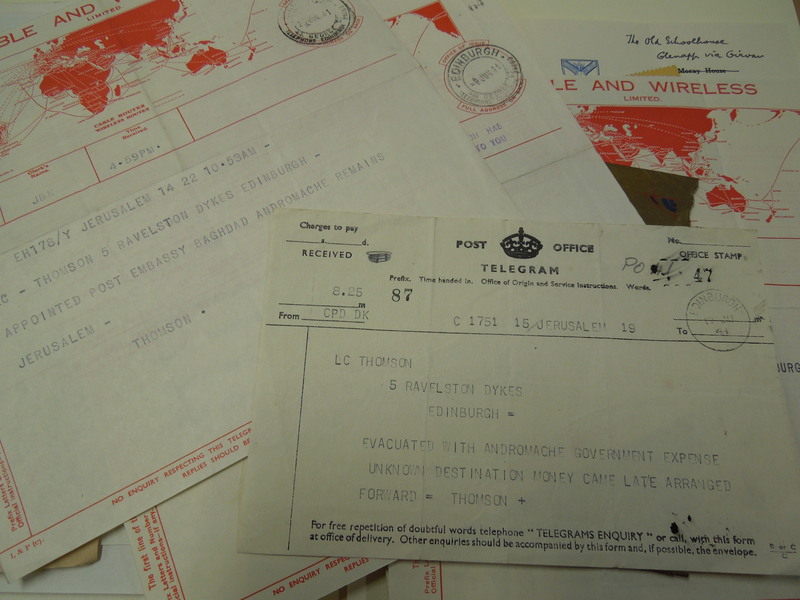 As I am now coming to the end of my time in Edinburgh cataloguing the papers of Professor Sir Godfrey Thomson, references aren’t terribly far from my mind! But I had some pause for thought after a conversation with my eighty-one year old Grandmother. 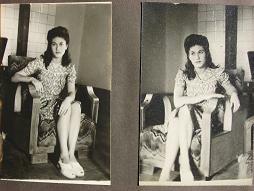 While most of my Grandmother’s contemporaries now shop, talk, and bank online, she remains resolutely uninterested. When I explained I would never see my references – they would be e-mailed, uploaded, etc, my Grandmother was particularly disdainful. For once, I found myself rather agreeing with her. References were often treasured by the subject, years after they no longer had use for them. They were a courtesy, a kindness. While their primary function was to allow the receiver to gain further employment, they were also an acknowledgement of their hard work, and usually written by someone the receiver respected and admired. References are still, undoubtedly, all of these things – but now, of course, the subject rarely has a copy, and employees rarely keep them for any length of time. Both are highly complimentary. 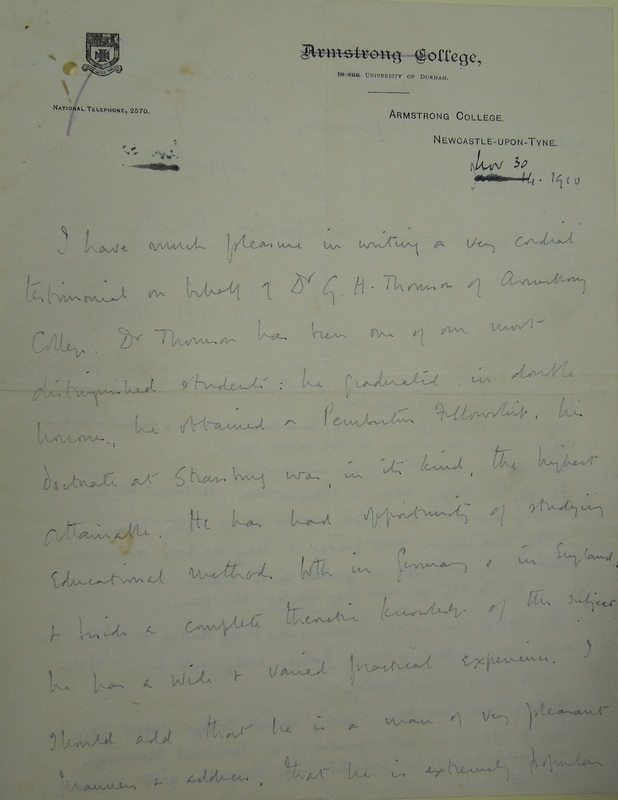 Hadow describes Thomson as ‘one of my most distinguished students…a man of very pleasant manners and address…extremely popular in college’, and praises his ‘remarkable power of influencing others for good’. Hadow was Professor of Education at Armstrong College while Thomson was in turn a student then lecturer. 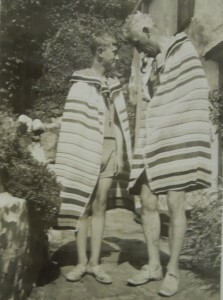 Both had in common a love of music – Hadow frequently wrote on the topic, while Thomson was a skilled pianist. 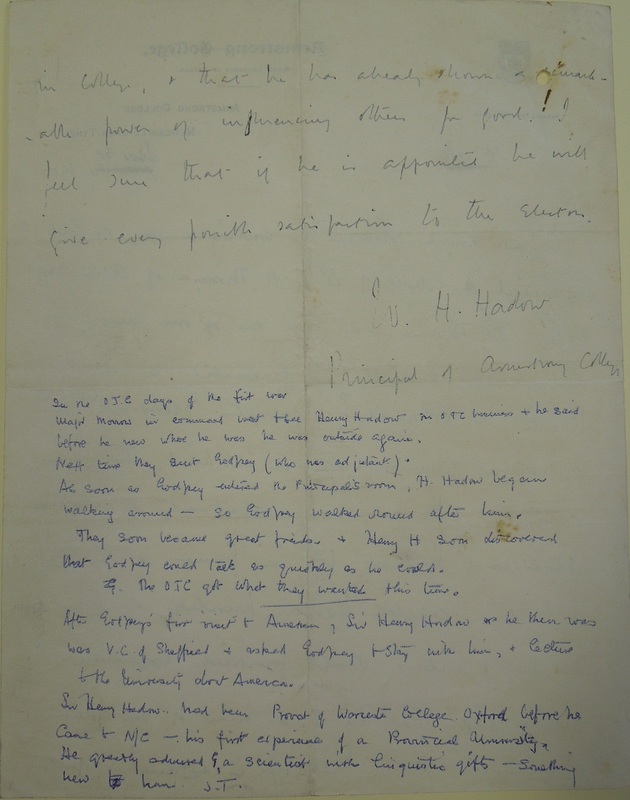 We know that both Thomson and Hadow were interested in the role that music could play in a liberal education, and Thomson’s lectures on teaching music survive in his collection. 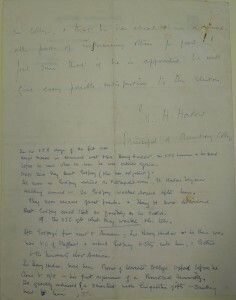 The notes written on the reverse of the reference are in Lady Thomson’s hand, and comment on Thomson and Hadow’s harmonious friendship and working relationship. 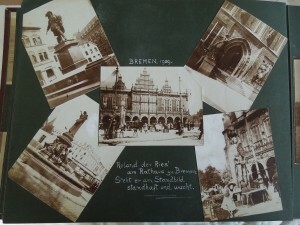 Braun was Professor of Physics at Strasbourg while Thomson was undertaking his DSc, supervised by Braun. He was an inventor, and experimented widely with wireless telegraphy. 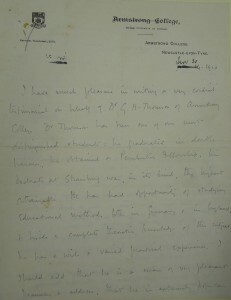 No doubt he would have been an exiting person for the young Thomson to work with, and it would appear the feeling was mutual – he describes him as well informed, and showing great ‘experimental ingenuity’. 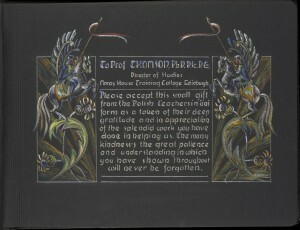 Part of the reason these references meant to much to Thomson is because they were unique, and written in the hand of men whom he had a great deal of respect for. While archivists are widely encouraged to see the beauty in bit code as much as they can illuminated letters (a gross exaggeration on my part!) I’m not quite sure how this will translate in our current day record creation. Laying the ever evolving issues of digital preservation aside, references simply aren’t prescribed with long term value. Which is a shame, because however biased they may be (which they are supposed to be – they are, after all, the opinion of the writer!) they certainly tell us a good deal about the subject. With thanks to Simone Müller and Christina Schmitz for their translations, and to Serena Frederick for pestering them for said translations! 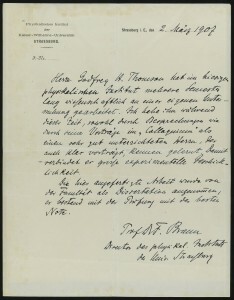 This entry was posted in Letters, Make history human, People, Projects and tagged CRC, Edinburgh University Library, Karl Ferdinand Braun, Professor Godfrey Thomson, Professor Sir Godfrey Thomson, University of Edinburgh, William Henry Hadow on April 30, 2014 by godfreythomsonproject. 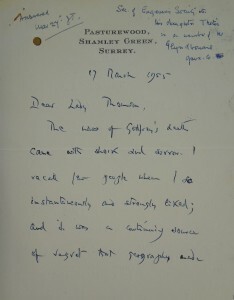 The letter was one of many sent from eminent psychologists, mathematicians, scientists, and former students to Lady Thomson following Thomson’s death in 1955. Flügel’s rather amusing anecdote, where he recounts a conference in Sweden Thomson chaired and describes how Thomson threatened to ‘chop off the heads’ of anyone who spoke over their allotted time, is true to character! This was, in fact, a pet hate of Thomson’s, well known to his students and colleagues. 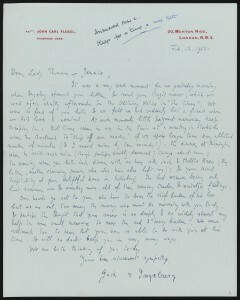 Lady Thomson’s annotations on the reverse of the letter are also important. They refer to a documented account of the seminar, though sadly the cutting is long gone, and endorse Flügel’s account, stressing it was the ‘correct description of Godfrey’s manner’. 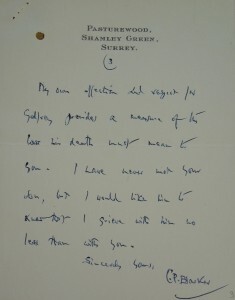 Her annotations can be found throughout the collection, and were most likely for her projected biography of Thomson (which she never undertook due to ill health) or to aid James Fitzjames Duff in his introduction to Thomson’s posthumously published autobiography, Education of an Englishman. Like Thomson, Flügel was a psychologist. 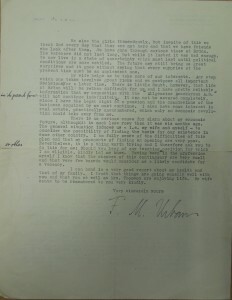 He was born three years after Thomson, and died a few short months after sending this letter. However, the course of his career and study was very different to Thomson’s. 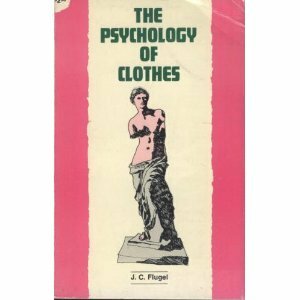 While Flügel was an experimental psychologist, first and foremost he was a practising psychoanalyst. He is credited as one of the few psychoanalysts who successfully bridged both academic psychology and psychoanalysis. His publications included The Psychology of Clothes (1940); Man, Morals and Society: a Psychoanalytical Study (1945); and the neo-Malthusian Population, Psychology and Peace (1947). During the six years I knew him personally, he occasionally discussed the conflicts which these two roles had produced, for he believed that such conflicts could not be resolved by accepting one role and abandoning the other. He felt strongly that the two approaches were working towards similar, general goals, toward a better understanding of human relations, and he did all he could to encourage each to proceed as far and as rapidly as possible. We were so fond of you both, and we felt we had suddenly lost a friend whom we both loved and admired…at such moments, little poignant memories keep creeping in…all of them rousing tender and nostalgic feelings. Our hearts go out to you who have to bear the chief burden of his loss, but we are only too aware of the many who must be mourning with you today and perhaps the thought that your sorrow is so deeply and so widely shared may help in some measure to ease the sad and heavy burden. 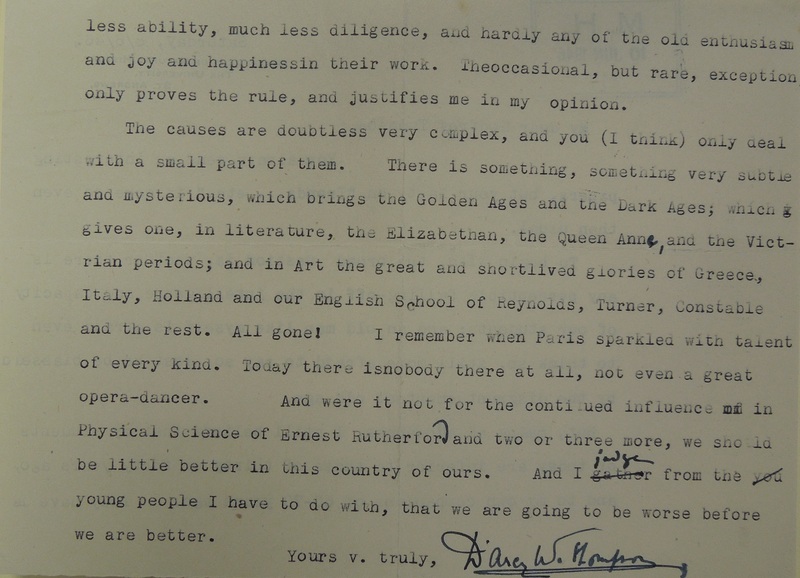 The most touching aspect of the letter for me, however, was not Flügel’s kind words, but the letter’s tone. 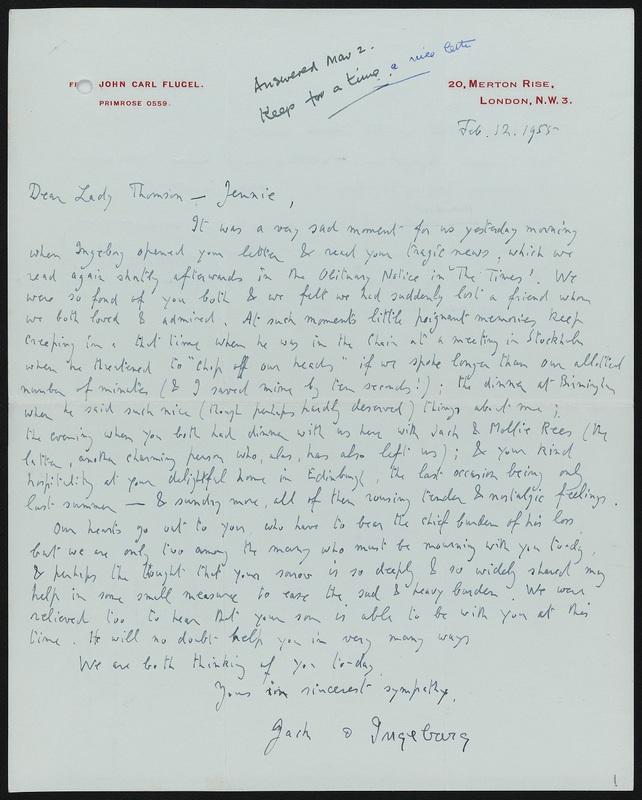 He refers also to the death of his friend, Mollie Rees, ‘another charming person who, alas, has left us’, and the reader is left with his general feeling of acceptance that both he and Thomson’s generation is coming to an end. Personal archives from any period of change are significant. Thomson’s collection is a case in point, covering eugenics, intelligence testing, and social mobility. They help in our understanding of these ‘big’ themes through the professional and personal relationships represented. At the risk of sounding twee, they allow us to explore what it means to be human at any given time, and give us ‘a better understanding of human relations’. This is perhaps their greatest value. This entry was posted in Letters, Make history human, People, Projects and tagged experimental psychology, John Carl Flugel, Professor Sir Godfrey Thomson, Psychoanalysis on April 2, 2014 by godfreythomsonproject. My favourite item from all the collections I have worked with in the past 10 months is a beautiful album in the Moray House collection. 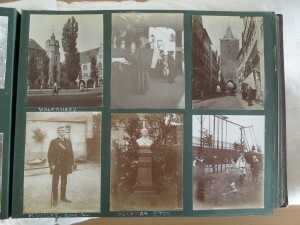 The album was made for Thomson by the ‘Polish Students in Uniform’. 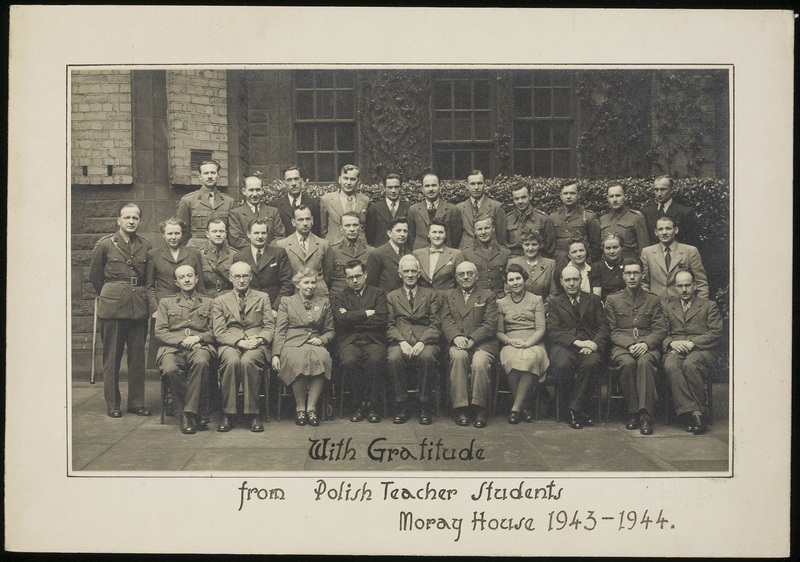 This initiative was likely very similar to the Polish School of Medicine, set up in the University of Edinburgh during World War II with the aim of training Polish students and doctors in the armed forces (almost immediately, civilian students too were accepted). 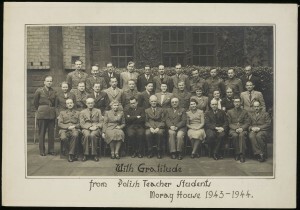 Students were trained in Polish, and could obtain Polish degrees. 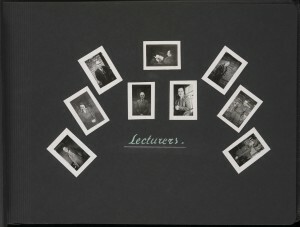 The album itself is a beautiful object – the colours, the drawings, even the positioning of the photographs. 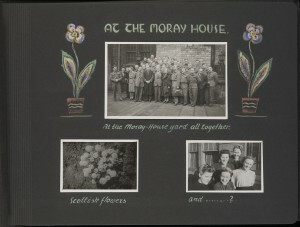 For me, however, what really makes this object wonderful is the informality of it, the spontaneous photographs and the witty captions combine to make it, in contrast to the formal staff and student photographs, a real snapshot of life at Moray House as the students knew it. Following German and Soviet occupation, hundreds of thousands of Polish people were deported from their home country – many of the students trained at the Polish School of Medicine would never return. 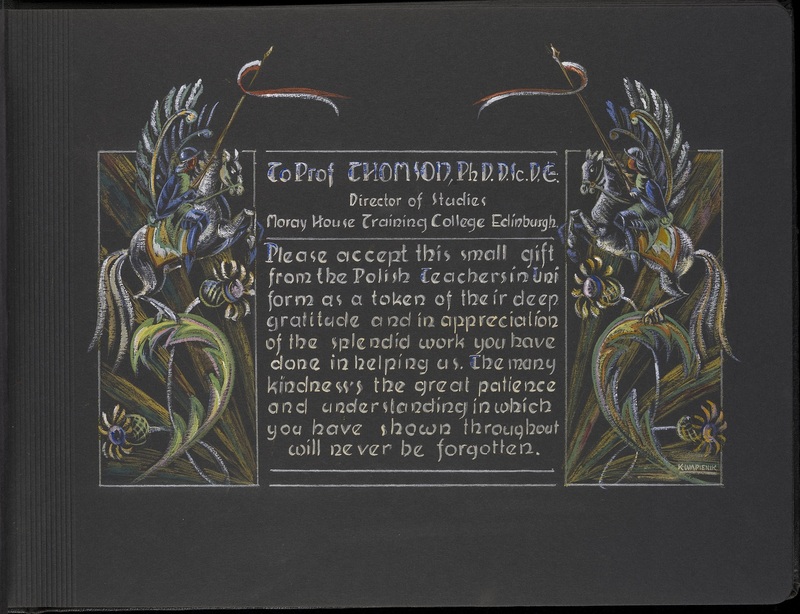 At such a time of sadness, upheaval, and uncertainty for the students, it is wonderful that, nonetheless, they took the time to thank Thomson for his kindness in such a thoughtful way. 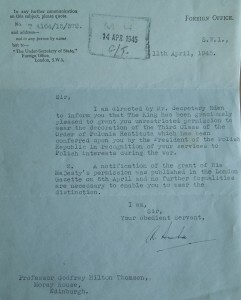 It is likely that Thomson’s work with the ‘Polish Students in Uniform’ is the reason that, on the 13th June, 1944, he was awarded the declaration of the Third Class of the Order of Polonia Restituta. 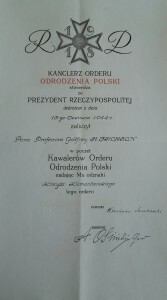 The order was conferred by the President of the Polish republic in recognition of his services to Polish interests during the war. The geneticist Francis Crew also had the award bestowed on him. 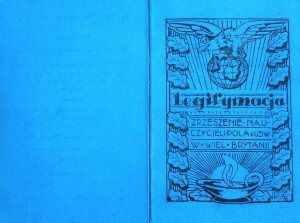 Roughly translated, the Polonia Restituta is ‘Order of Rebirth of Poland‘. 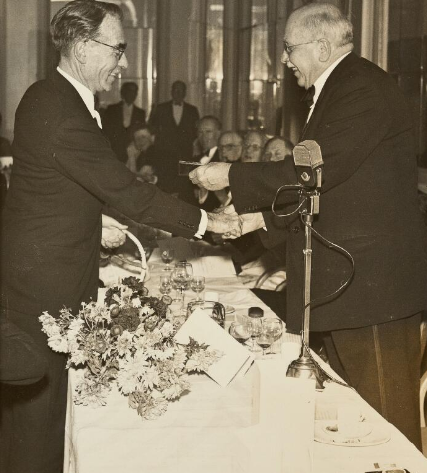 It is generally awarded, and has been since 1921, for outstanding contributions to education, science, sport, culture, art, economics, national defence, social work, civil service or diplomacy. 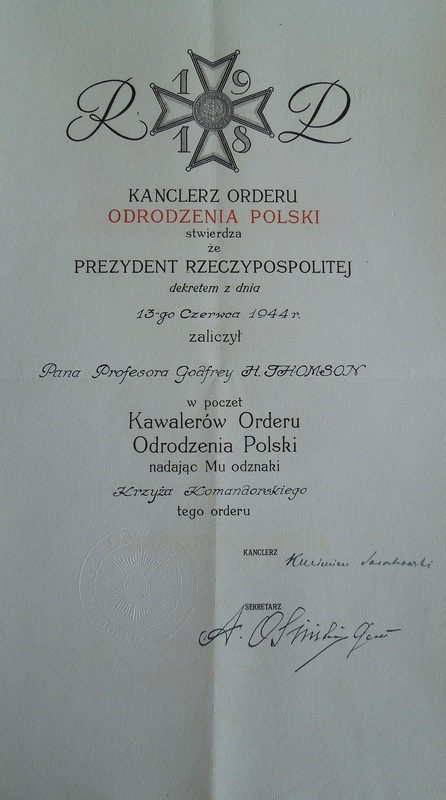 The vast majority of those awarded are naturally given to Polish nationals. 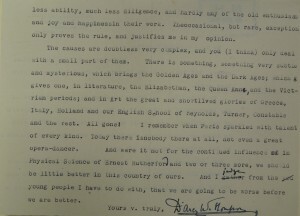 Thomson’s award also came along with a letter from Anthony Eden (well, at least his secretary!) 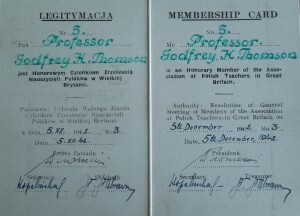 and an honorary membership card for the Association of Polish Teachers in Great Britain. 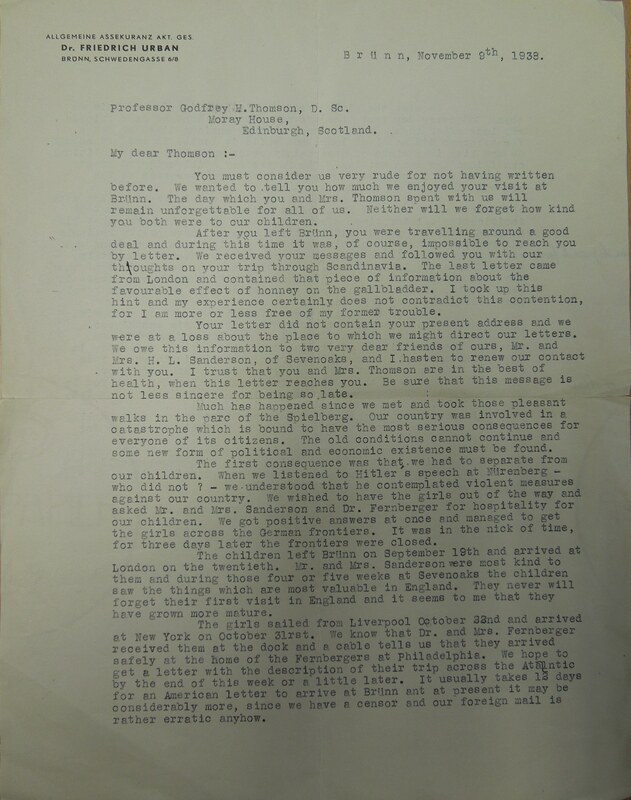 Thomson has often proved an illusive character to those researching his history – in oral testimonies from those he worked with or who studied under he has in turn been described as reserved, friendly, quick tempered, even tempered, etc.! 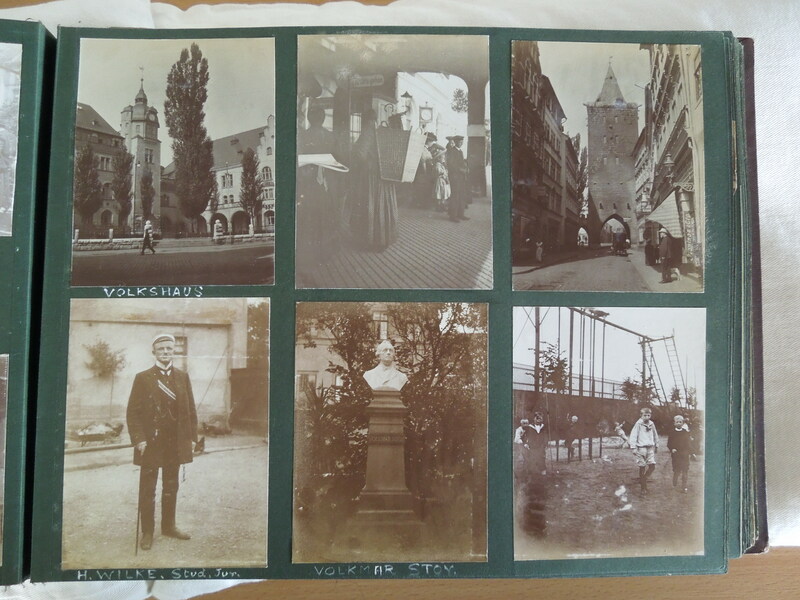 But objects such as the photograph album, as well as the many letters sent to Thomson’s widow by his students, show that his students were very much at the heart of what he did. 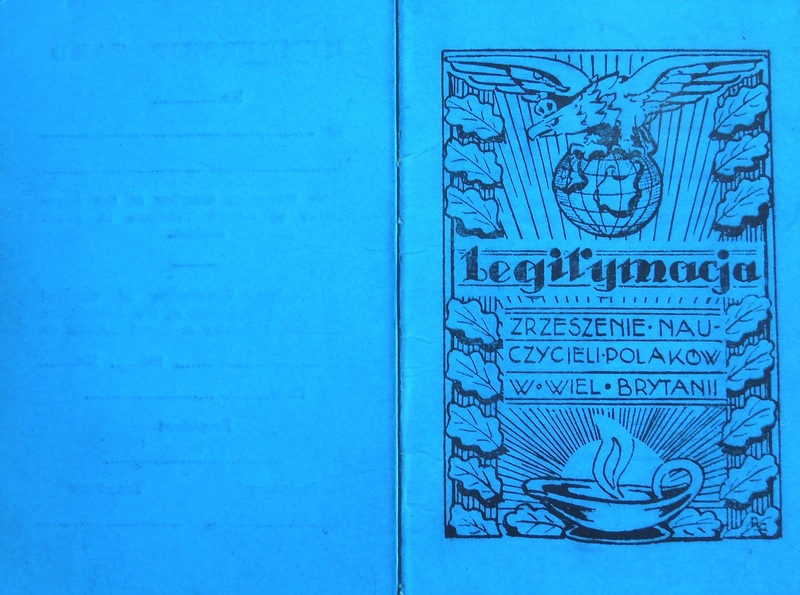 With many thanks to Ela Wiklo for information about the Polonia Restituta. 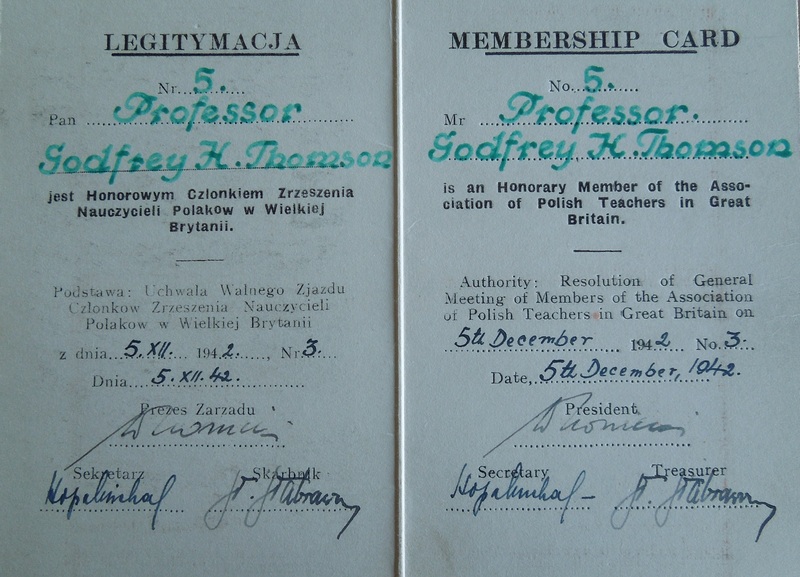 This entry was posted in A few of my favourite things, Letters, Make history human, People, Projects, World War II and tagged CRC, Edinburgh university Library Special Collecions, Polish School of Medicine, Polish Students in Uniform, Polonia Restituta, Professor Sir Godfrey Thomson on March 19, 2014 by godfreythomsonproject. 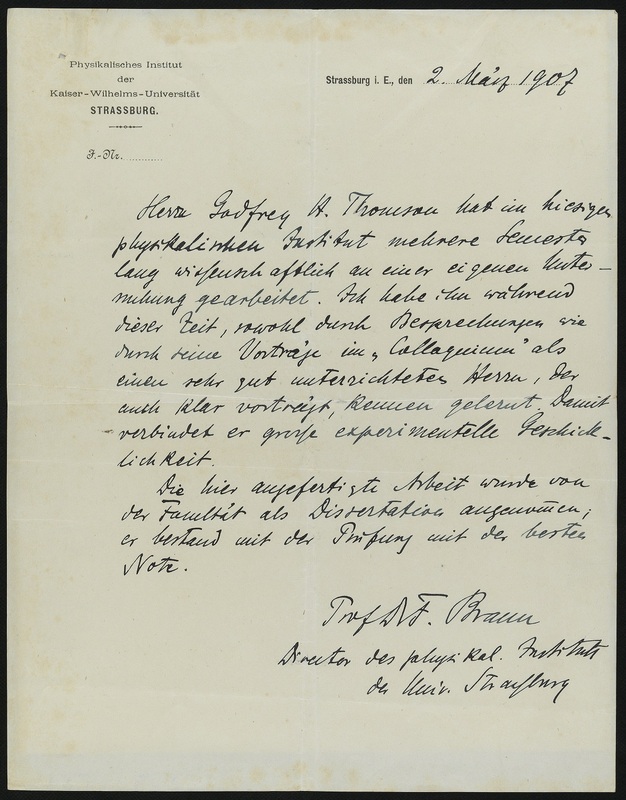 It is not clear from Thomson’s papers how he knew Urban – quite possibly he had met him while studying in Strasburg, during which time he undertook a tour of Europe. Much has happened since we met and took those pleasant walks in the parc [sic] of the Spielberg. Our country was involved in a catastrophe which is bound to have the most serious consequences for its citizens. The old conditions cannot continue and some new form of political and economic existence must be found. The first consequence was that we had to separate from our children. 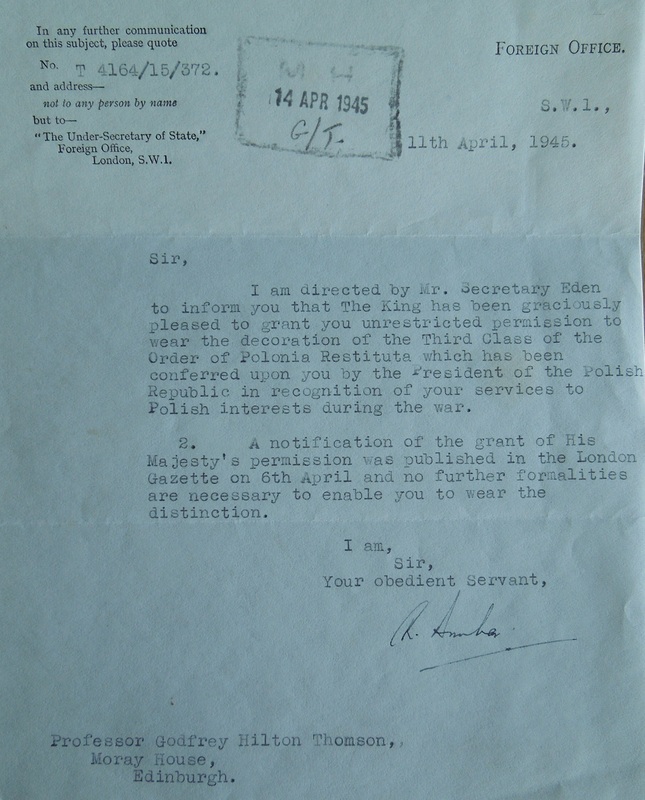 When we listened to Hitler’s speech at Nurenberg [sic] – for who did not? – we understood that he contemplated violent measures against our country. We wished to have the girls out of the way and asked Mr and Mrs Sanderson and Dr Fernberger for hospitality for our children. 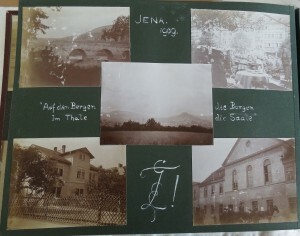 We got positive answers at once and managed to get the girls across the German frontiers. It was in the nick of time, for three weeks later the frontiers were closed. 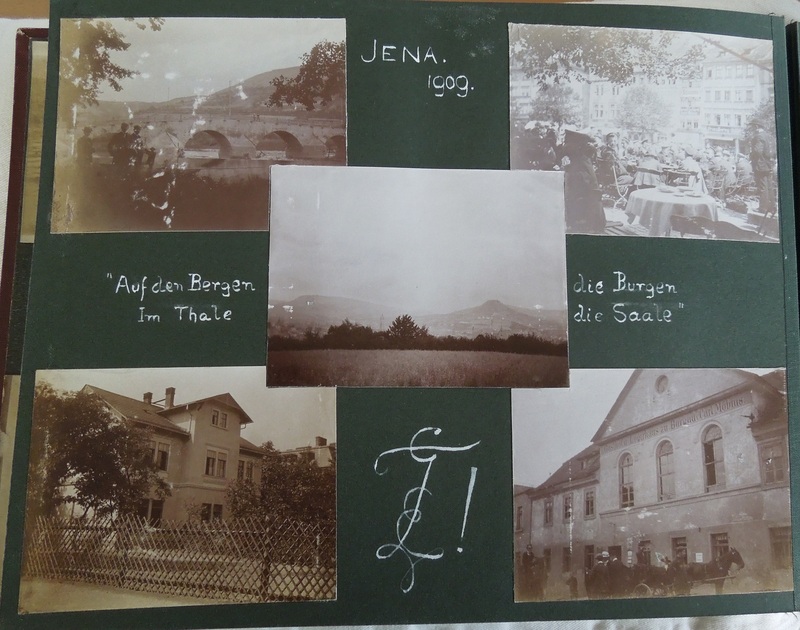 There is much about the letter that is perplexing – initially, I thought Urban might have been writing from Brunn in Austria, but for the addition of the umlaut (both Germany and Austria have regions called Spielberg to confuse matters further). He could also have been writing from Brno in the Czech Republic, which does not seem an unlikely option considering Brno is home to Spielberg castle and was captured by Germany in 1939. However, it does seem rather unlikely that Urban would use the German spelling of his town in that instance. If we are to assume that Urban is writing from Germany, his phrase ‘our country was involved in a catastrophe’ is an interesting one. The ‘catastrophe’ he refers to is likely the annexation of Austria by Germany, which took place earlier in the year. It was a catastrophe caused by Germany’s actions rather than their involvement, but he makes a clear distinction between the activities of the Nazis in this instance and ‘our’ country, his country, refusing to identify one with the other. We miss the girls tremendously, but inspite [sic] of this we thank God every day that they are not here and that we have friends who look after them. 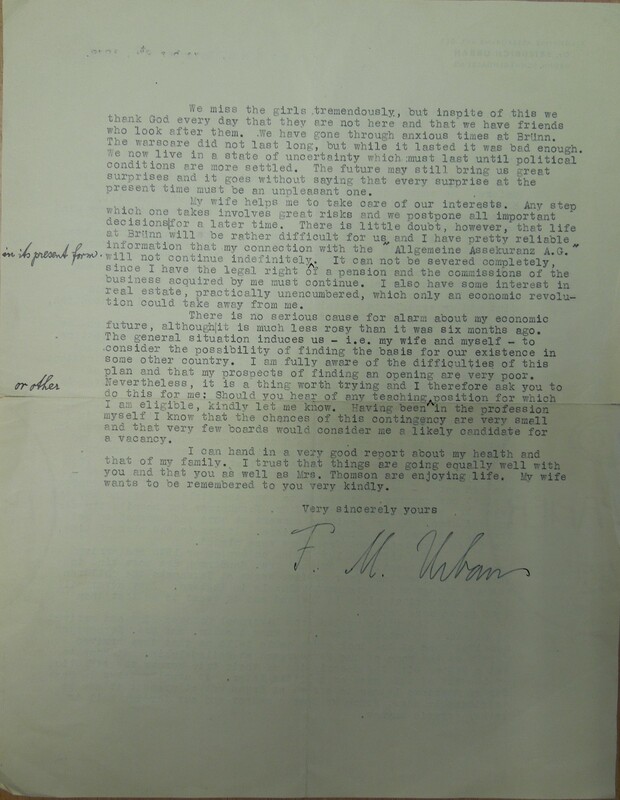 He talks about how life at Brunn will likely become ‘rather difficult’, and asks for Thomson’s help in finding teaching work in Britain. While he accepts that this may be impossible, and admits his chances of securing work in Britain are ‘very small’, Urban remains optimistic nonetheless – thankful even – that his daughters are safe, and his health good. I can find no trace of Urban – whether he and his wife were ever reunited with their daughters remains a mystery. For me, this serves to make the letter, which describes the plight of millions throughout Europe from the perspective of one individual to another, all the more touching. If you have any information regarding Dr Urban, do please comment. 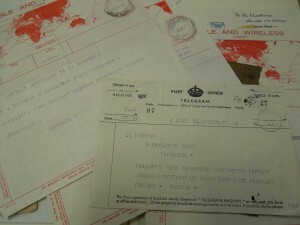 This entry was posted in Letters, Make history human, People, Places, World War II and tagged CRC, Dr Friedrich M Urban, Edinburgh University Special Collections, Nuremberg rally, Professor Sir Godfrey Thomson, World War II on March 3, 2014 by godfreythomsonproject. Valentines Day. A wonderful time of year when we can indulge in levels of cynicism and sarcasm simply unacceptable at any other! However, here in the archives our hardened hearts are often shamefully disarmed by the traces of friendship, romance, and (dare I say it!) love we come across every day within our collections. Those of you familiar with Greek mythology may know the story of Hector and Andromache – Hector the bold Trojan warrior, and Andromache, his beautiful wife. For those who do not, the story doesn’t end happily, with Hector killed at the hands of Achilles. 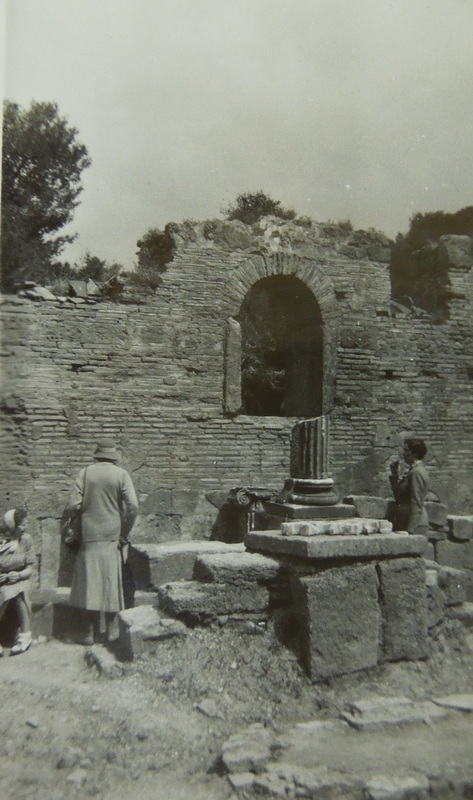 Today’s Valentine’s blog is about another Hector and Andromache – Hector Thomson, the son of Godfrey Thomson, and his rather beautiful wife, the aptly named Andromache. From the outset, despite their fateful monikers, the pair seemed a rather unlikely match. Hector, according to one family friend, was socially awkward, quiet, and was most likely to be found with his nose in a book. Andromache, according to the traces of her in the letters of others, was the sort of house guest welcome at every home, who could bring cheer to even the most despondent of households. Sadly we have no photographs of Andromache in the archives. 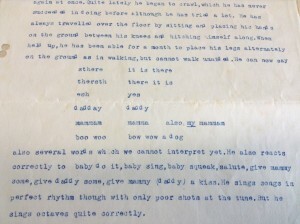 This scan was given to us by a relative. Hector began his career as an Oxford educated Classicist. 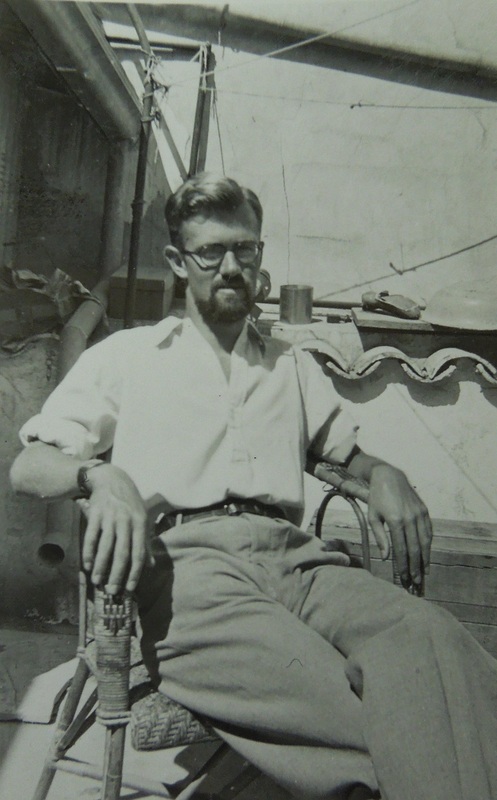 Perhaps surprisingly when compared to the accounts we have regarding his boyhood, he finished his degree with a yearning of adventure, and entered the diplomatic service, working in Baghdad. We would dearly love to hear from you, and especially to hear more about Andromache, but I know communication must be precarious. His parents, of course, had their own love story. 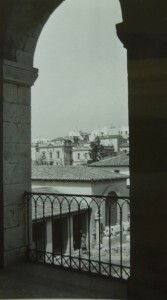 Hector also fell in love with Cyprus – his letters to Thomson from this period discuss both the language and the religion of the Cypriots in great detail. Details which Thomson with his enquiring mind would have found fascinating. 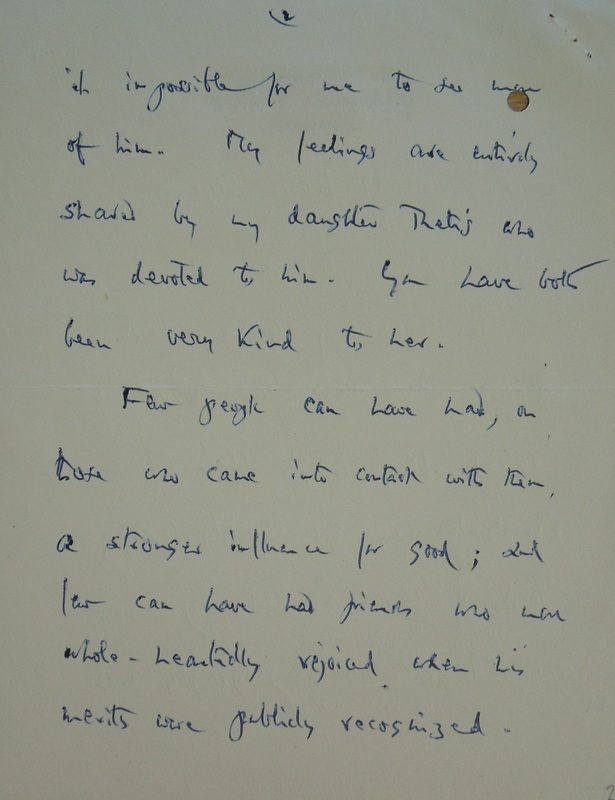 References to Andromache in the surviving letters are brief, with the Thomson’s sending their love and asking how she is – but we know in later years that the Thomsons, along with many of their friends and acquaintances, would affectionately call her ‘Mackie’. 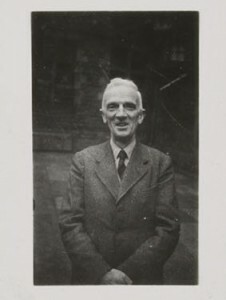 After their wedding, they settled in Aberdeen where Hector eventually became senior lecturer in Ancient and Modern Greek at the University of Aberdeen. Hector’s teaching techniques owed a lot to his Father’s career as a psychologist and professor of education, throughout which Thomson emphasised the need to gain and keep the attention of students and pupils. This is by no means an uncommon idea now, but one which was new and innovative in Thomson’s time. 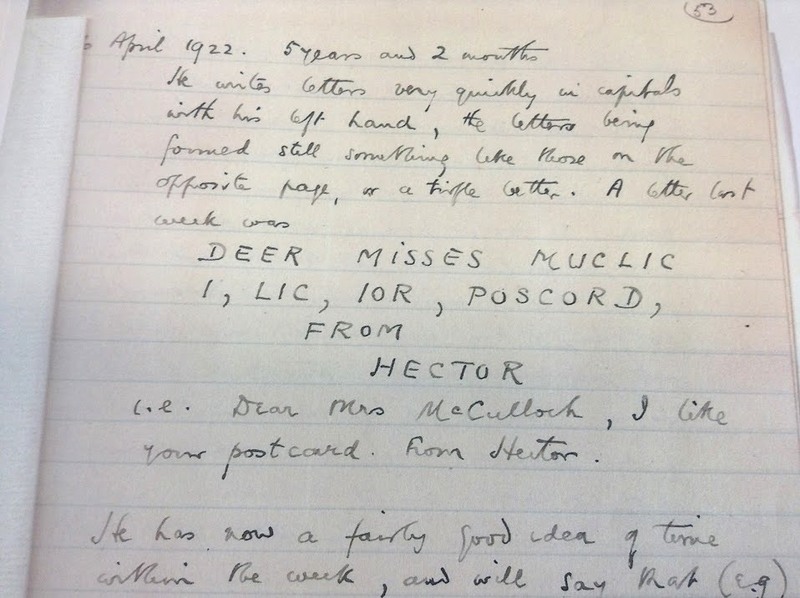 His Father’s methods are reflected in the many ways Hector grabbed and maintained the attention of his students, apparently even making yoghurt in one lecture! He endeavored not only to teach his students Greek, but invited them to share in his love of Greek culture. Following his retirement, he and Andromache spent their time between the Thomson’s former home in Ravelston Dykes, Edinburgh (left to Hector in their will), and Cyprus. Hector died on 19th February 2008, aged 91. According to her relations, Andromache was bereft after his death, and decided to move back to Cyprus permanently. A few short months later, she too passed away. Hector and ‘Mackie’ were married for 67 years – they were a true love match. Now that, dear readers, is better than chocolates, flowers, and stuffed toys clutching hearts! This entry was posted in Letters, Make history human, People, Places and tagged CRC, Edinburgh University Special Collections, Hector and Andromache, Professor Sir Godfrey Thomson, University of Aberdeen, University of Edinburgh, Valentines Day on February 14, 2014 by godfreythomsonproject. 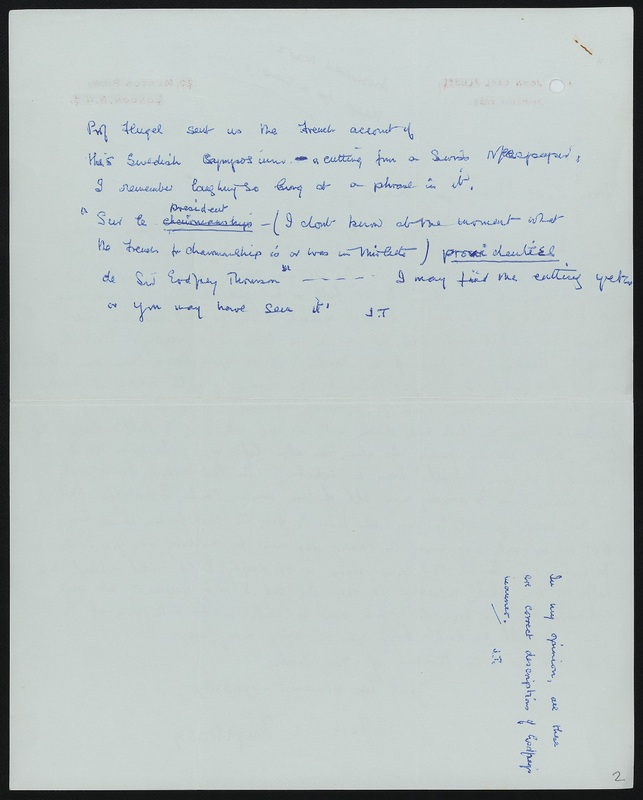 Our Wellcome Trust funded project*, ‘Documenting the Understanding of Human Intelligence: cataloguing and preserving the papers of Professor Sir Godfrey Thomson’, is on course to deliver on all its objectives in the next few months. 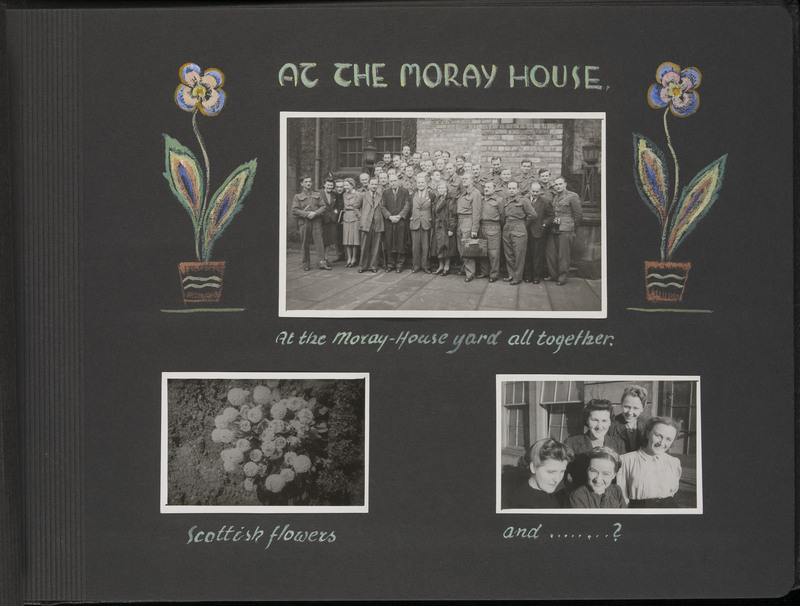 Continuing on from the cataloguing project, we aim to digitise Thomson’s papers, and catalogue related papers through the Moray House and University of Edinburgh collections. We will also be curating an exhibition regarding Thomson’s life and work in 2016. To mark this exciting and continuing collaboration between the academic and archival communities, we are holding a free seminar for researchers, students, and archivists at Edinburgh University Library, 16th May 2014. 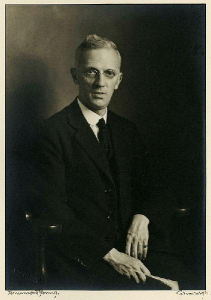 Professor Sir Godfrey Thomson (1881-1955) was a psychologist, statistician, and educator. The seminar programme reflects this, and is a varied one exploring Thomson’s work in Psychology (especially cognitive testing), Statistics, Education, and Eugenics, with academic speakers from each field. Chaired by Professor Dorothy Meill, Vice Principal and Head of the College of Humanities and Social Science, It will also discuss current scientific research facilitated through data sets left from Thomson’s work, as well as the complexities involved in interpreting and cataloguing the collection itself. 10.30: Professor Ian Deary, Director, Centre for Cognitive Ageing and Cognitive Epidemiology: ‘Use of Thomson’s data today in studies of cognitive ageing and cognitive epidemiology’. 12.00: Dr Edmund Ramsden, ‘Thomson’s research and opinions on the differential birth rate and eugenics’. The seminar is free, but please note places must be booked through eventbrite. Wellcome Trust bursaries for accommodation and travel are available. For further information, contact Emma.Anthony@ed.ac.uk. *Funded by the Trust’s Research Resources grant scheme under the call ‘Understanding the Human Brain’. Continuing on from the current cataloguing project, we aim to digitise Thomson’s papers, and catalogue related papers through the Moray House and University of Edinburgh collections. 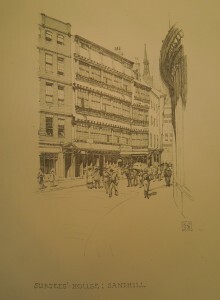 We will also be curating an exhibition regarding Thomson’s life and work in 2016. This entry was posted in Educational Research, People, Projects, Scottish Mental Surveys and tagged Archives, archives seminar, CCACE, Centre for Cognitive Ageing and Cognitive Epidemiology, Centre for Research Collections, differential psychology, education, epidemiology, history of education, Professor Godfrey Thomson, Professor Ian Deary, Professor Sir Godfrey Thomson, psychology, Scottish mental surveys, seminar, Statistics on February 5, 2014 by godfreythomsonproject. Disgruntlement. The archives are full of it – though I should stress I am referring to the contents of our records rather than our lovely readers (or indeed my lovely colleagues)! 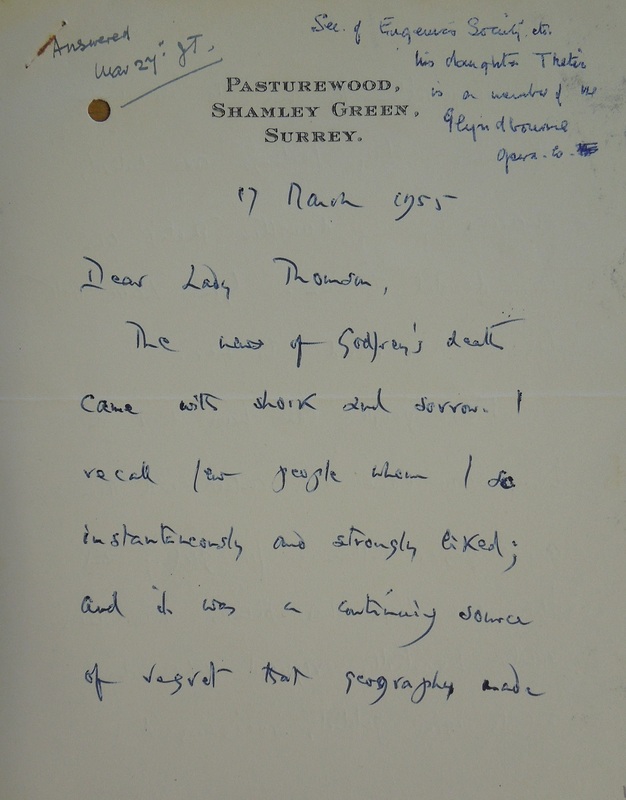 This week’s letter is a wonderful example of disgruntlement from the eccentric and brilliant zoologist and classicist, D’Arcy Wentworth Thompson (1860–1948). 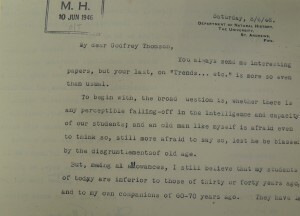 The youth, he tells us, simply aren’t what they used to be: Thompson wrote the letter to Thomson in 1946 to congratulate him on his Galton Lecture, ‘the Trends of National Intelligence’, which explored the idea that as a nation, our intelligence was in decline. I still believe that my students are inferior to those of thirty or forty years ago, and to my own companions of 60-70 years ago. They have less ability, much less diligence, and hardly any of the old enthusiasm and joy and happiness in their work. There is something, something very subtle and mysterious, which brings the Golden Ages and the Dark Ages; which gives one, in literature, the Elizabethan, the Queen Anne, and the Victorian periods; and in Art the great and shortlived glories of Greece, Italy, Holland and our English school of Reynolds, Turner, Constable and the rest. All gone! I judge from the young people I have to do with, that we are going to be worse before we are better. 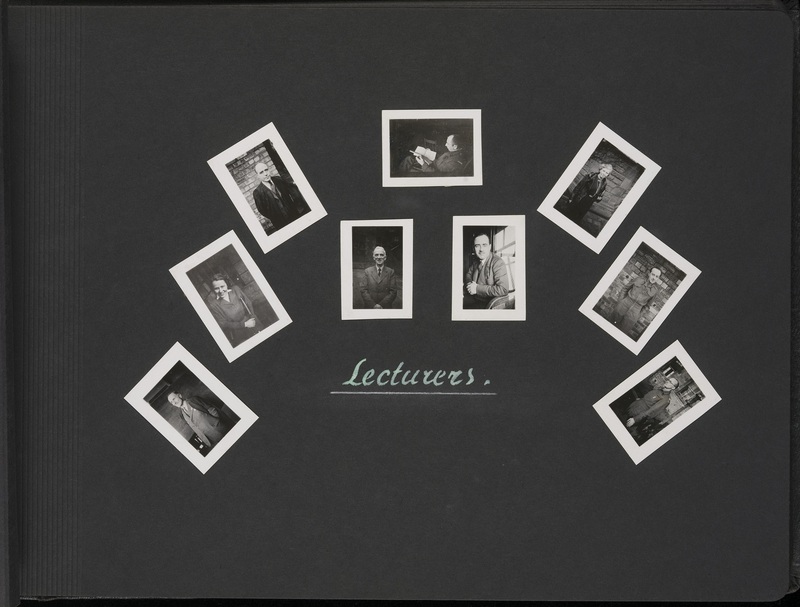 But despite appearances, Thompson loved teaching – he was a renowned speaker whose lecture halls were packed, and he encouraged his students to exercise their enquiring minds. Even while he lay on his death bed, Thompson’s students visited and livened up his last days with discussion and debate. 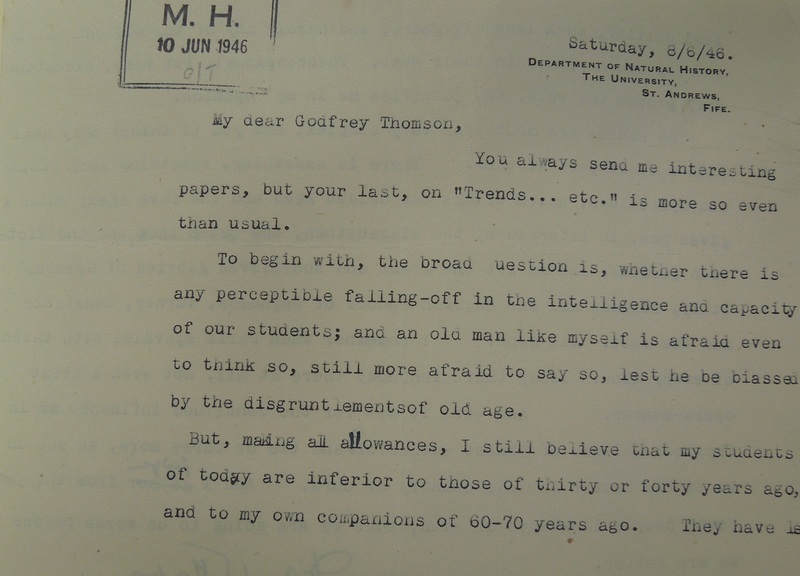 Any disappointment hinted at in his letter to Thomson could be attributed to his own brilliance, which perhaps caused him to expect similar levels of extraordinariness in those he taught. 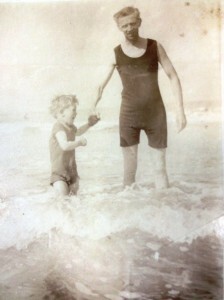 Thompson’s love of biology was awakened by his Grandfather, who, along with Thompson’s Aunt, brought him up in Edinburgh. 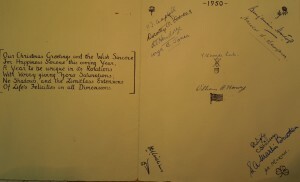 This was due to the death of his Mother and his Father’s appointment as professor of Greek in Queen’s College, Galway. He was educated at the Universities of Edinburgh and Cambridge – gaining a first, naturally, and was appointed professor of biology in University College Dundee. The importance of artefacts in teaching was clear to Thompson from the outset. Under his guidance a rich museum of zoology was created, helped by the Dundee whalers. 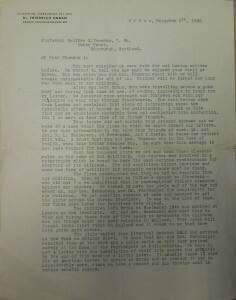 Thompson himself was deeply interested in whaling, visiting the Pribylov Islands as a member for the British–American ‘inquiry on the fur seal fishery in the Bering Sea’. This interest would continue throughout his life, seeing him speaking at international conferences; appointed CB (1898); becoming a member of the fishery board for Scotland; and becoming a British representative for the International Council for the Exploration of the Sea. 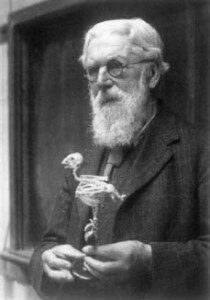 In 1917, Thompson accepted the post of senior chair of natural history in the United College of the University of St Andrews. Thompson’s published output was vast, and included papers on biology, oceanography, classical scholarship, and natural history. 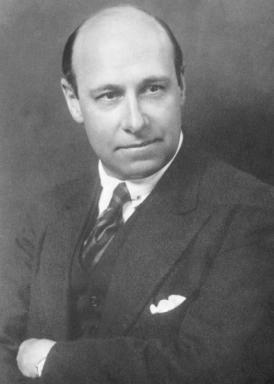 He had several honours bestowed upon him, including his election as fellow of the Royal Society of Edinburgh (1885); his election as fellow of the Royal Society (1916); the Linnean gold medal (1938); the Darwin medal (1946); and his knighthood (1937). Despite his description of himself as a ‘disgruntled old man’, Thompson encouraged the youth surrounding him to think, to enquire, and to explore – something he did right up until the end of his life. 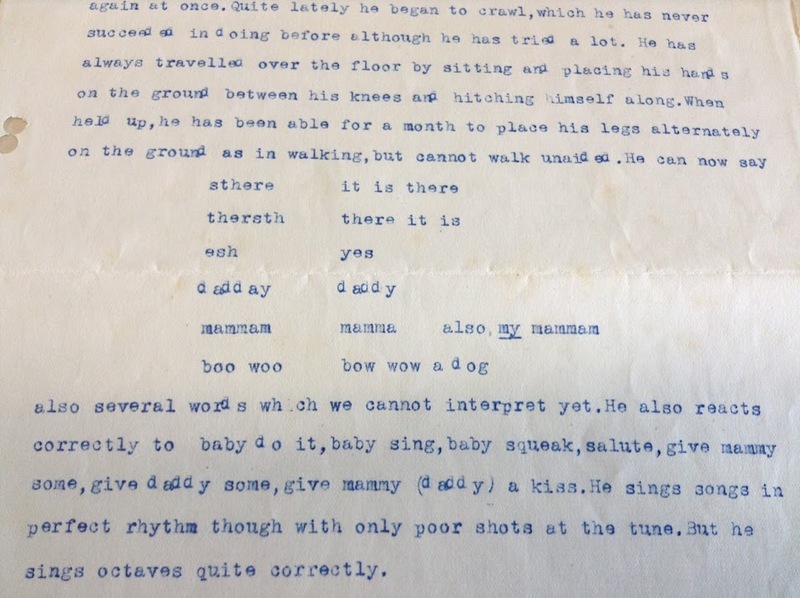 This entry was posted in Educational Research, Letters, Make history human, People, Projects and tagged CRC, D'Arcy Wentworth Thompson, differential birth rate, Edinburgh University Special Collections, Eugenics, Intelligence, natural history, Professor Sir Godfrey Thomson, University of Edinburgh, University of St Andrews on February 5, 2014 by godfreythomsonproject. 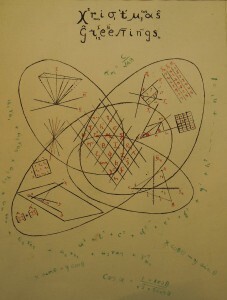 Quite possibly the best Christmas card I’ve ever come across – spelling ‘Christmas’ in mathematical terms. Genius! And if that wasn’t zany enough, there is a wonderfully nebulous poem on the inside! 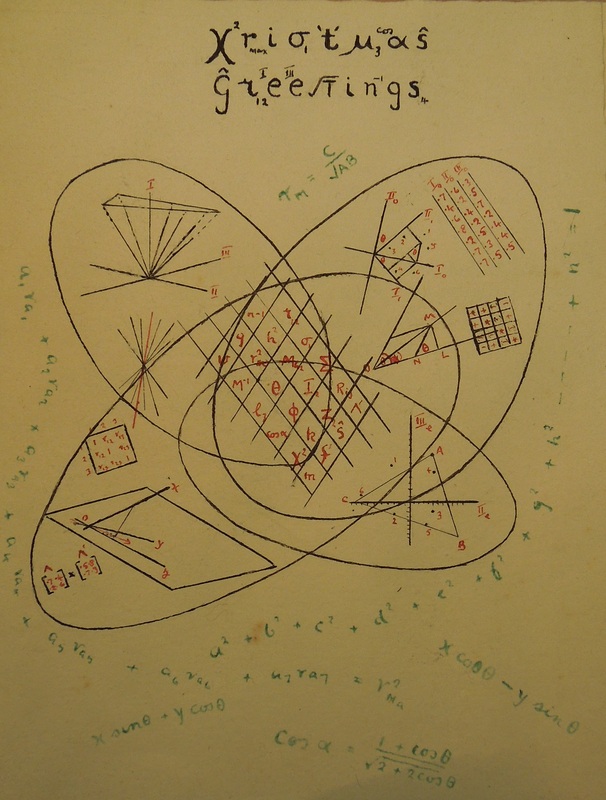 In all seriousness, this is one of my favourite items in the collection – it is signed by 13 of Thomson’s students, who were obviously very fond of him, and I bet the master of Factorial Analysis loved it! Andromache was the wife of Thomson’s son, Hector. Hector was a classicist, so the mythical love story of Hector and Andromache would have been one familiar to him. 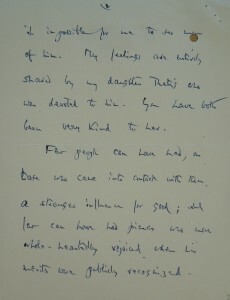 She is a frequent character in the collection, and is mentioned throughout Thomson’s correspondence by friends and family – Thomson and Lady Thomson appear to have been particularly fond of her. The card depicts her native Cyprus. The gift is a thoughtful one – Thomson was brought up near Newcastle, and the sights in this book would have been familiar to him. 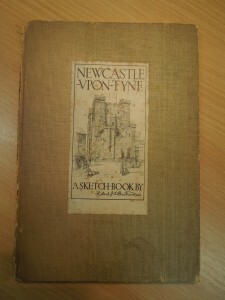 The book has clearly been well loved and frequently referred to, and has some beautiful images of Newcastle. 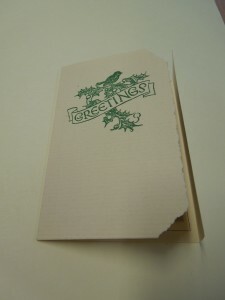 With that, I’d like to wish you all a lovely Christmas and a productive New Year! 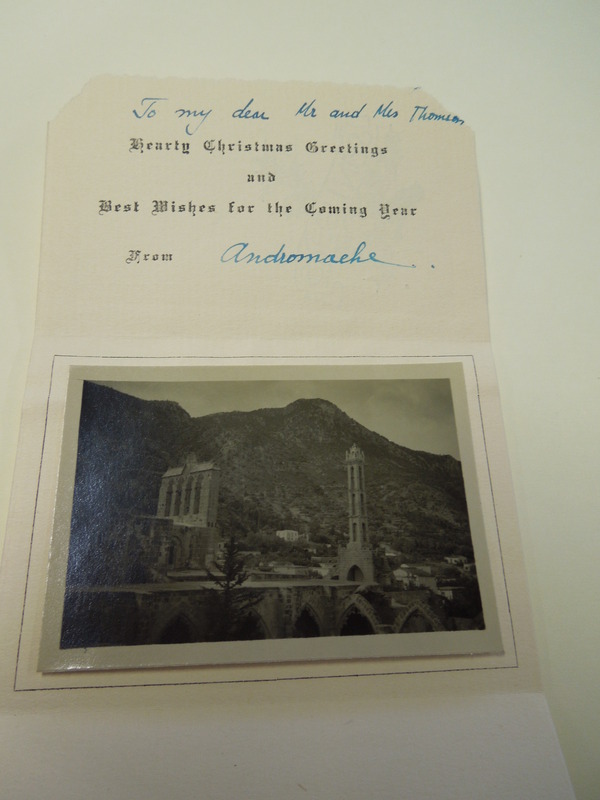 This entry was posted in A few of my favourite things, Letters, Make history human, People, Places, Projects and tagged Christmas, Cyprus, Hector and Andromache, mathematics, Newcastle, Professor Godfrey Thomson, Professor Sir Godfrey Thomson on December 19, 2013 by godfreythomsonproject.